I've been having trouble getting back into the swing of things at this blog, so I'm going to try the "10 Reasons Why" approach. The post can more or less write itself this way! I'm starting with this particular list in celebration of Blogger https allowing me to make even better use of my announcements blog (more about that here). 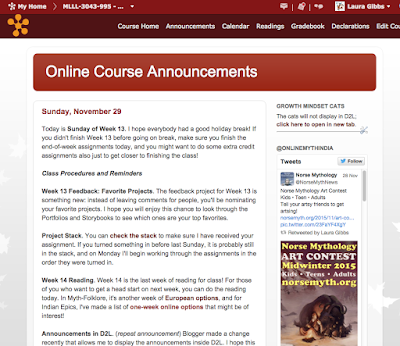 First, you might take a look at my Class Announcements blog. There's a new announcement every day, including Saturday and Sunday (Saturday is a slow day, admittedly, but Sunday is probably the busiest day in terms of students who are doing work for class). 1. Modeling a blog for my students. Given that my students are also blogging for class, I appreciate being able to model the usefulness of blogging for my students, along with good practices in formatting, linking, etc. There is no particular value in modeling my use of D2L BS for them. Real school requires real tools, in my opinion, not faux tools like the LMS. 2. Blogs are open, not trapped in the LMS. I believe in open education and, when I publish something on the open Internet, it becomes an OER. There are people who subscribe to my class announcements blog who are not in my class because they find the content fun to read, and I also sometimes share my class announcements with the social networks I am part of at Google+ and Twitter. 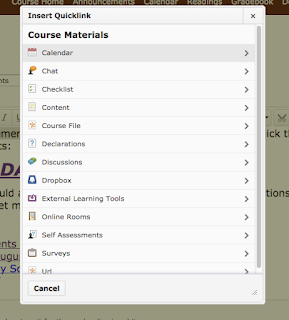 There is no way to make anything inside D2L open to anybody anywhere; it is completely closed. 3. One blog, two classes. Although this might not be relevant to others, it is very relevant to me: I have two different classes, but I use the same class announcements blog for both. If I were to do the announcements inside the LMS, I would have to do separate announcements for the two classes (even if the content were identical! ), and if I have to edit or update the announcements, I'd have to do that twice. Nightmare! 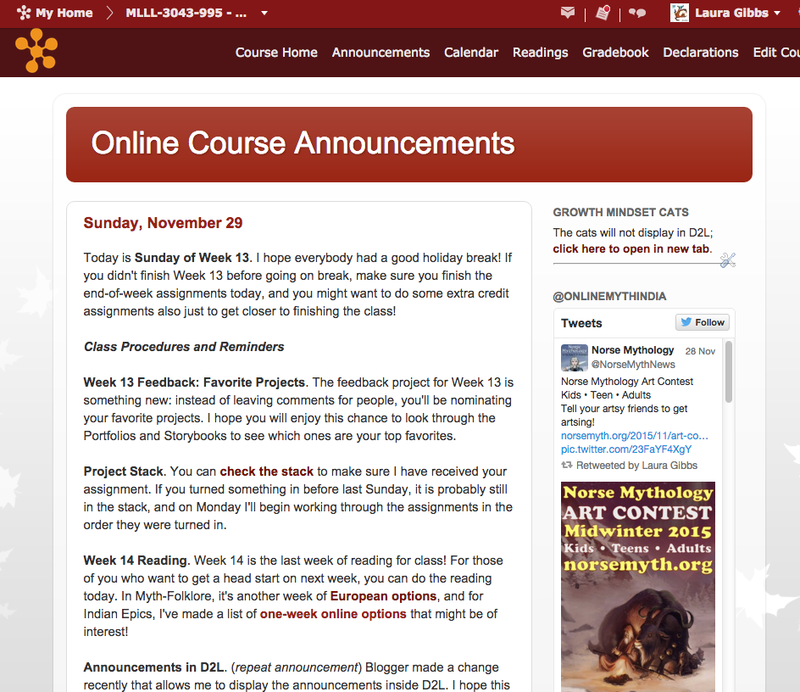 With a blog, I can update one blog and have it appear as the LMS homepage for both of my classes. 4. Blogs are great for quick publishing. I use blogs as the publishing platform for pretty much everything I do. For me, it is much more congenial than trying to create content inside the LMS. In Blogger, for example, links are easy by design: highlight link text, Control-K, Control-V. In contrast, just try creating a link with the editor in D2L: it assumes you want to create a link to a tool in the course, so the task of creating a link to something on the real Internet is a long and convoluted process. Look how you have to scroll down to create a link to a URL; the list is alphabetical and URL just happens to be the very last item on the list. 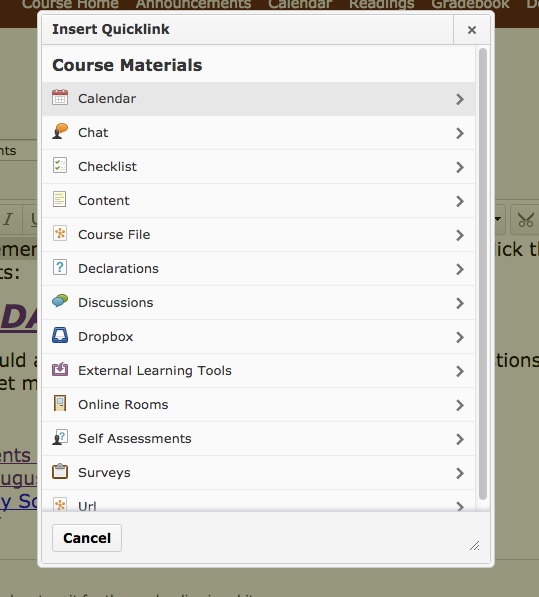 D2L may call it "quicklink" ... but there is nothing quick about it! 5. Blog posts are linkable. I can include links to specific announcements in emails that I send to students. This is most useful when I need to remind them about something that was highlighted in the announcements a few days ago. Plus, students can click on the link and see the announcement without having to log in to the LMS. So, for example, if a student is working on Dante and I want to share with them a Dante video that was in the class announcements last week, I just provide a link to that announcements post. And, yes, there's an advantage to linking that way rather than to the video directly: I like to get students to pay attention to the announcements; you never know when they might find something else in there that is useful to them. 6. Blogs look good on mobile. For students who might be reading the class announcements on a mobile phone, they look great! Blogger has good mobile-detection, and it switches to a nice mobile-friendly display automatically. So, if a student gets an email reminder from me that contains a link to the class announcements, they will see the mobile version of the announcements automatically if they are reading that email on their phone. Just add ?m=1 to a Blogger blog post URL to see the mobile view. This is actually very handy for creating print-friendly versions of other content I publish with Blogger (like the UnTextbook materials); you can always bring up the mobile version in your browser window and print that, which is much more efficient than printing the standard view. 8. Blogs have sidebars! 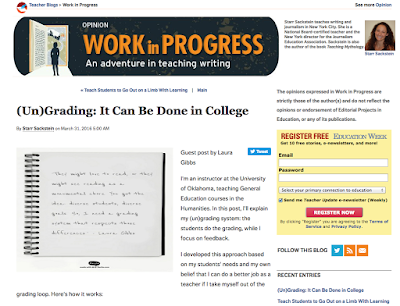 Admittedly, I am never sure if students will look at the sidebar of the blog, but I can put some useful information and eye-catching content there on the optimistic assumption that it might get noticed. So, for example, I currently have a class Twitter feed in the sidebar, along with a random growth mindset cat, plus some other basic information and links relevant to the classes. If students are looking at the blog on a mobile device, they don't see the sidebar, but they do see the sidebar if they are looking at the blog in their browser or in the LMS. I love the way the Twitter sidebar lets me keep the content "lively," so that for students who log in more than once in a day, there is the possibility that they will see different images there in the sidebar each time (and, of course, they can click and go to the Twitter stream directly from that widget display). Just for fun, I've embedded that Twitter widget down at the bottom of this blog post too. 9. Blogs are useful content repositories. Almost all the content in my announcements is recycled; I add a little bit of new material every semester, but I rely heavily on past semesters. By labeling the blog posts week by week and using weekday titles, I can quickly access past posts, reminding myself what I might need to be telling students on, say, Tuesday of Week 7. Here, for example, is a label that shows you all the Week 7 posts over time. I would never trust an LMS as a real content repository because, sooner or later, we are going to move to a different LMS; it's inevitable. With blogs, I can download and back up my blog and even move it to another platform if I want, although I've been happily using Blogger far longer than we have had D2L at my school, and I expect I will be using Blogger long after D2L has been replaced by something else. 10. And when the LMS is down.... my blog is up! Pretty much every semester, the LMS is down for some reason or another, and sometimes it is part of a wider campus outage. By having my class announcements outside the LMS, I can let students know about the outage and provide them with regular updates.